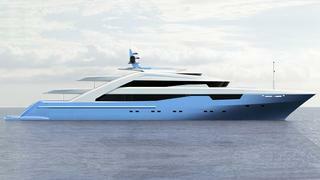 The architect Filippo Rossi has sent us the first renderings of his new design developed for the Italian yard ISA, the ISA 640. Based on the 63m platform developed by the yard and already used for a yacht launched in 2010, this new design has a length of 64m. Some details were imposed by the yard, the main one being to include the ISA trademark aft staircases that link each deck together from stern to flybridge. "This choice of conception has always fascinated me since the first time I saw it" explained Filippo who enthusiastically accepted the challenge. Another feature was planned with great attention to detail, the beach club. Rossi wished to create a place of pleasure, with a bar in the corner, large volumes to host a solarium and a retractable pier for tenders and toys, the whole experience aimed at reminding guests of a real beach. This beach club is linked to all the aft decks thanks to the large staircases as mentioned earlier, giving a 'go-faster' look to the design, an impression reinforced by the design of the windows and the wheelhouse. As final result, Filippo Rossi has given an aggressive and strong silhouette to the yacht, very much in the tradition of ISA.